I left my usual patch behind today for a memorable outing with members of my family to the Cambridge University Botanic Garden. The Garden is an oasis of calm in a busy city. As soon as you enter, you can feel the tranquillity and escape the noise. One memorable moment was early on in my visit when a small bird flew across my legs when I was in the bee garden. It landed on a branch of a nearby tree and from there I could see it was a robin. It wouldn’t wait for me to take its picture, however, instead it disappeared behind the trunk! Fortunately, after a few moments, it reappeared to peck around in the grass closeby, so I caught it on camera then! There were bumble bees of various species all over the 40-acre site, which is one of the world’s leading botanic gardens. They included white tailed and tree bumble bees, and I saw a few honey bees and some hoverflies. They were surprisingly busy, despite the chilly 14 degree temperature and largely overcast weather, although at least it stayed dry! The gardens have 8,000 plants species from all over the world and in all sizes, from little violets to massive redwood trees. There are nine national collections; I saw the national collection of geraniums, which, like the ones we have at home, were much liked by the bees. I enjoyed the massive Limestone Rock Garden and smaller Sandstone Rock Garden with their ranges of plants from different parts of the world. Here there was a beautiful lake with water lillies, whose leaves I can imagine on a warm summer would be teeming with dragonflies – today I spotted two damselflies. 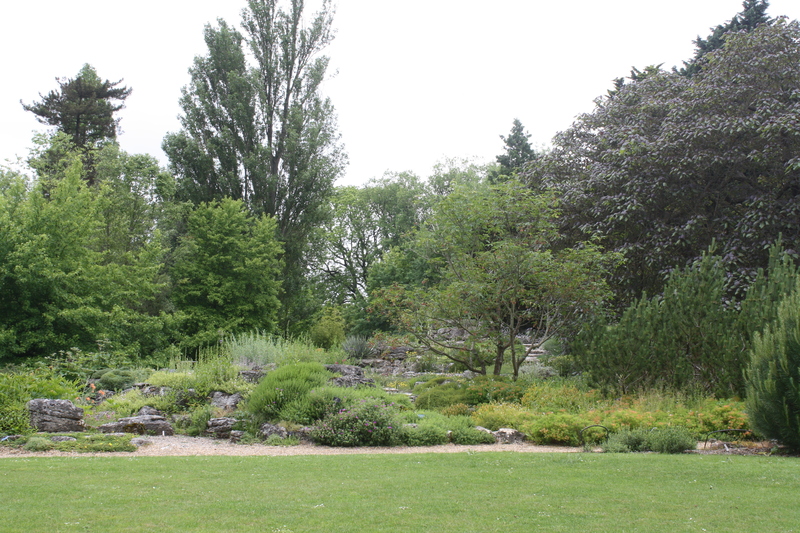 The rock garden from our picnic bench. There really is loads to see amongst this Grade II* heritage landscape for plant and wildlife lovers. You can learn so much. If you need to warm up, you can visit the range of glasshouses with various habitats including arid lands with cacti, rainforests and waterways. One area has a recreation of a fen landscape of yesteryear and you can discover the development of roses from mediæval times to the present day in the rose garden. Another section takes you through the mysteries of plant families and another looks at British wild plants. The glasshouses seen through some plants. 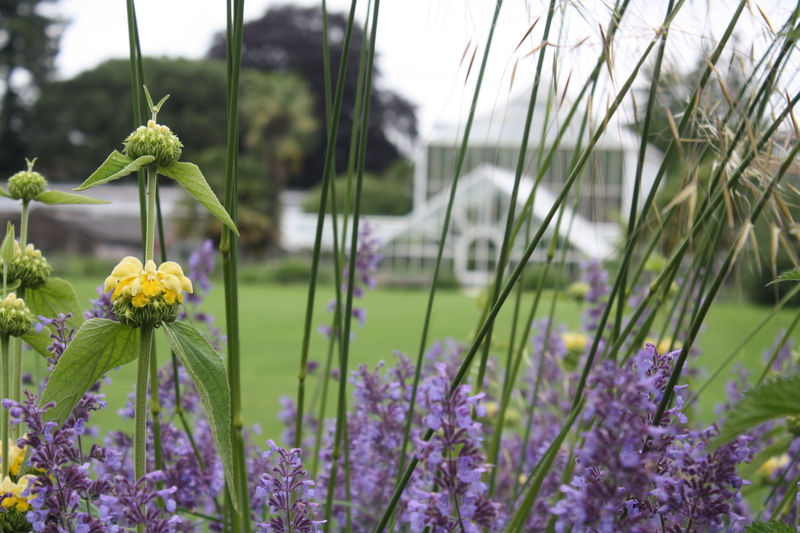 The current garden was inspired by John Stevens Henslow, Professor of Botany from 1825 to 1861, and was opened in 1846. Henslow’s most famous student was Charles Darwin. Henslow also encouraged the University to establish a collection of trees, which included some of the many exotic introductions being brought into the country in the 19th century. It is considered the best collection of trees in the eastern region and it also includes the first specimens of the dawn redwood to be planted in the UK. I liked the way the areas around the trees had been left to grow a little wild. 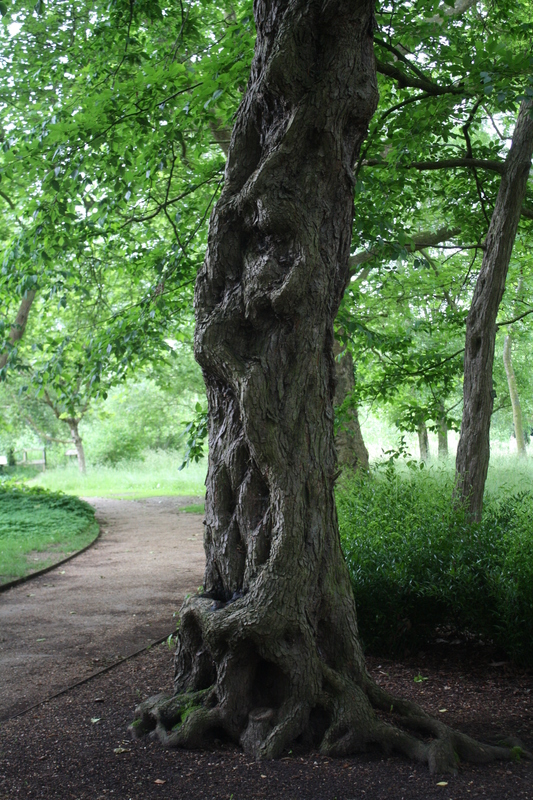 The bark on this hop hornbeam caught my eye. We also managed to fit in a picnic lunch to mark “National Picnic Week”. We ate our meal sitting on a bench in front of an elder tree laden with blossom and within sight of the huge and splendid rock garden. At one stage, a robin hopped about a few feet in front of us while we ate. Some of the trees and flower beds.